The Russia Investigations: Why Are Democrats Avoiding The Russia Imbroglio? Democrats have placed their chips as they try to unseat Republicans — but not on Russia red. Meanwhile, a liberal billionaire outsider has built a massive organization intent on impeaching Trump. Nancy Pelosi could be restored as House majority leader if the Democrats do well in the midterms. Democrats have placed their chips as they try to unseat Republicans — but not on Russia red. This week in the Russia investigations: Why aren't the Democrats trying harder to exploit the Mueller investigation? And Deputy Attorney General Rod Rosenstein is set to stop by for a little visit to Congress. The president's onetime national security adviser, campaign chairman, campaign vice chairman, campaign foreign policy aide and others have pleaded guilty to federal charges. The president's son before Election Day in 2016 met with representatives of the same foreign government that employs roughly two dozen people charged by the Justice Department with attacking the election. It's a slam dunk for political opponents, right? Wrong. Although the subject comes up and the party has elected to attack President Trump and Republicans for what they call a "culture of corruption" — which broadly involves the Russia saga — the big political focus is elsewhere. One reason is that Democrats want to program their messaging in affirmative ways, especially on health care, as NPR's Scott Detrow has reported. They want to run on it and in support of the Affordable Care Act, in addition to all the running against Trump they are doing. The president and Republican leaders in Congress are happy to meet Democrats on that playing field, as Trump did on Twitter, for example, on Thursday. Moreover, Trump is happy to talk about alleged collusion and alleged obstruction of justice — because he hasn't committed either one, he says. That's a "hoax," a "witch hunt," and the product of "derangement" by his political enemies. A report from the Wesleyan Media Project confirmed the focus of the midterm campaign in terms of ad spending: The 2018 elections are the health care elections, it found, to the exclusion of many other big issues and especially Russia. Other interesting issue discussion from 2018 include: 3.8 percent of federal airings in the last month mention opioids and only 0.1 percent of airings mention Russia. Looking at U.S. Senate airings only for which the Wesleyan Media Project has supplemental coding information from English-language airings from September 18 to October 15, zero airings mentioned Robert Mueller, Russia or the Mueller investigation. 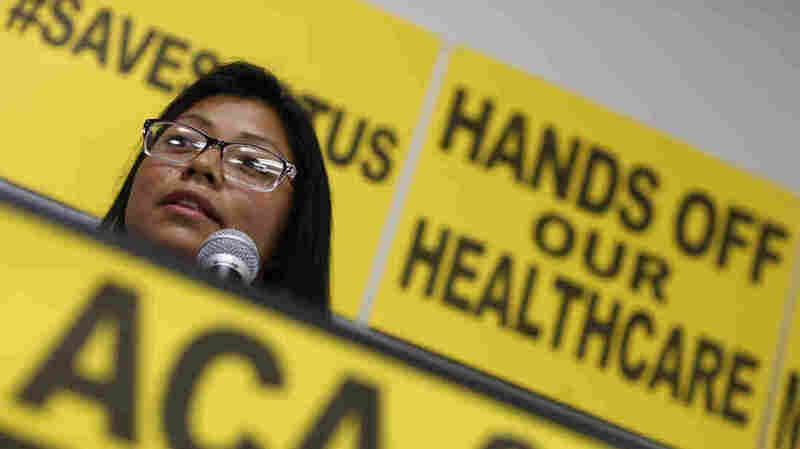 A woman speaks at a news conference in support of the Affordable Care Act in Las Vegas. Democrats want to program their messaging in affirmative ways, especially on health care. The Russia story has not turned out the way that Trump's political opponents had hoped. Liberal commentators especially used to talk about the Trump presidency as though it were a temporary "tryout" and that Trump would be swept away in no time by a Mueller cast as an avenging angel. Fast forward to now, when Democrats say that even if they take control of Congress — which is a long shot as compared with simply reaching a majority in the House — they won't necessarily make trying to get rid of Trump a priority. Former Vice President Joe Biden, dipping his toe into the water for a 2020 presidential run, said he hopes that if Nancy Pelosi is restored as House speaker, she wouldn't try to impeach Trump right away. Pelosi herself doesn't want to use the I-word if she can avoid it. 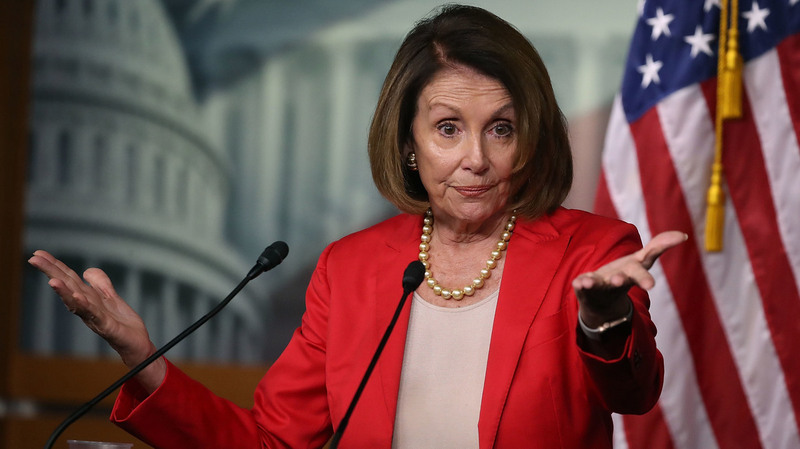 Instead, she wants to mitigate high negatives about herself in red districts and knit together as many moderates as possible to form the kind of coalition she needs to retake control of the House. That's not good enough for the most liberal minority of Democrats, led from outside by billionaire Tom Steyer, who has been running a months-long national media campaign aimed at impeaching Trump. Steyer's organization has been building steam, and if Pelosi becomes speaker again, it could bring a huge amount of pressure on her and Trump in 2019; as The Atlantic's Edward-Isaac Dovere reports, Steyer's network reaches more people than the National Rifle Association. The bottom line for both Republicans and Democrats is that they don't know what's at the bottom of the Russia imbroglio. If Mueller were to produce a certified letter from Putin to Trump pledging support for his campaign in exchange for favorable governance, that would take this story in a new direction. Anything short of that, however, given the once-apocalyptic expectations by Trump's enemies of what the Russia story might mean, will seem to them like a letdown, as Politico's Darren Samuelsohn reports. Then again, there sure are a lot of accusations these days about foreign influence in U.S. elections. Trump has accused the opponent he vanquished in 2016, Hillary Clinton, of conspiring with the Russians. He and Vice President Mike Pence accuse the Chinese of interfering more severely in the United States than the Russians. Trump claims Democrats are supporting the "caravan" of migrants headed for the southern U.S. border, a charge that has no basis in fact but which furthers the collusion storyline. Is this a strategy to make "collusion" seem ubiquitous ahead of whatever might issue soon from the special counsel's office? Democrats complained this week that the discussion was "irresponsible" — they called it a strategy to disguise how little, in their view, Trump has done in response to Russia's active measures since 2016. Deputy Attorney General Rod Rosenstein is scheduled to conduct a long-delayed visit to Capitol Hill on Wednesday, albeit one slightly different from the trips he's made before. House Judiciary Committee Chairman Bob Goodlatte, R-Va., and House oversight committee Chairman Trey Gowdy, R-S.C., say they'll interview Rosenstein behind closed doors themselves, along with ranking members Jerry Nadler, D-N.Y., and Elijah Cummings, D-Md. None of the rank-and-file members will be there. Deputy Attorney General Rod Rosenstein is scheduled to conduct a long-delayed visit to Capitol Hill on Wednesday. 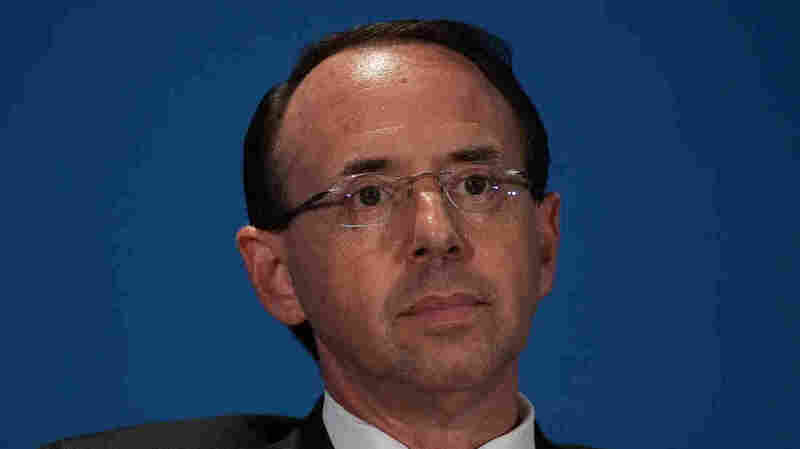 Rosenstein will swear an oath to tell the truth, and a court reporter will record the session, committee officials said. Once the transcript has been reviewed and cleared by the intelligence community "to avoid the public dissemination of classified or otherwise protected information," it will be "publicly available," they say. When? Good question. That may depend on Rosenstein's answers. If the deputy attorney general says something like, "yeah, I wore a wire, see, and I sent my G-Men to bug the president's bedroom and we've been wiretapping his phone," that may find its way into the press swiftly — ahead of Election Day in just a few weeks. If Rosenstein sticks to the public accounts he's given about his conversations early in his tenure at the Justice Department, the transcript might not make much of a splash. The deputy attorney general isn't the only witness meeting with members of Congress, even though both the House and Senate are in recess for the campaign season. Nellie Ohr, the woman who worked for the political intelligence firm that commissioned the Steele dossier — and who is married to Justice Department official Bruce Ohr, who kept in contact with Steele — visited Congress on Friday. And onetime junior Trump campaign foreign policy adviser George Papadopoulos is due on the Hill on Thursday. He has been an aggressive booster of Trump's since his sentencing, and Papadopoulos' theorizing about how he was set up by the British or Australian governments will likely be music to the ears of Trump's allies in the House. Remember that wild Bloomberg Businessweek story that said that China had waged an industrial-scale hardware-based cyberattack against American government and business? That there were tiny spy chips in server hardware in use across the tech world? Apple, Amazon and others denied it at the time, and they continue to deny it stronger than ever. In fact, Apple wants Businessweek to retract the whole story. A previous version of this story misspelled and incorrectly named The Atlantic's Edward-Isaac Dovere as Issac Dovere.